DEWALT DWS774 216mm Slide Mitre Saw w/ XPS The DWS774 Sliding mitre saw from Dewalt is an incredibly functionalpower tool that has been designed with professionals in mind and suits commercial and domestic working environments.The mitre saw features a powerful 1400 watt motor providing up to 6300 blade rpm's giving fast, clean and efficient cuts in a range of wood types. 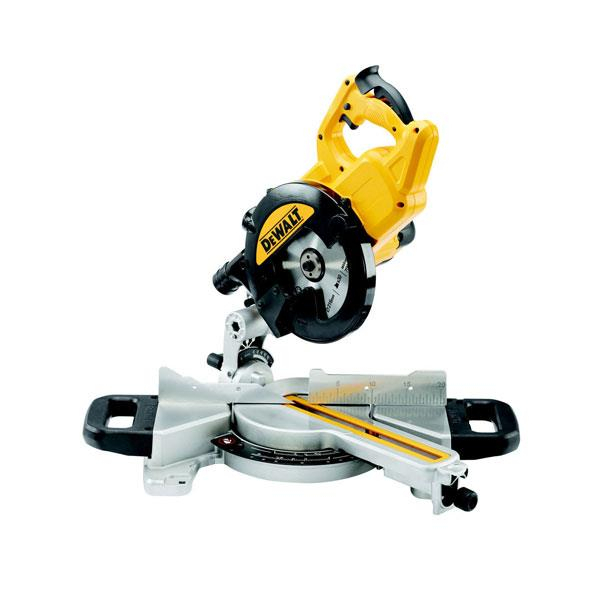 Like most top dewalt products the DWS774 mitre saw incorporates their branded XPS shadow system for improved cutting accuracy while boasting a large cut capacity of 62 x 250mm. Built with safety in mind the saw is airlock compatible and allows for the addition of a dewalt dust extraction system, providing users with a dust free work area. A new and enhanced mitre angle adjustment system provides accurate and consistent setting of mitre angles. The saw uses current dewalt mitre detents for accurate and repeat cuts. Weighing 12Kg, it is lightweight and portable. It features dual additional carrying handles for portability that also serve as a support extensions for large materials. Finished in the classic black and yellow trademarked colours. ◦Classic black and yellow finish. ◦Suits a range of working environments. ◦XPS shadow system for extreme accuracy. ◦Air lock & Dust extraction compatible. ◦Enhanced mitre angle adjustment system - accurate and consistent mitre settings. ◦Uses current Dewalt detents - ideal for repeat cutting. ◦Handles also serve as additional support for large cut materials.